From your doorstep, groomed trails lead you into a fairyland of blue skies, frozen waterfalls, ice trees, and grazing animals. From a guided tour inside Yellowstone Park to the excitement of riding in the National Forest lands where wide open spaces of deep powder beckon to the kid in you-it's all waiting, and easy to do! Whether you're a greenhorn or seasoned rider, it's our pleasure to make your snowmobile vacation one you'll want to repeat every year. 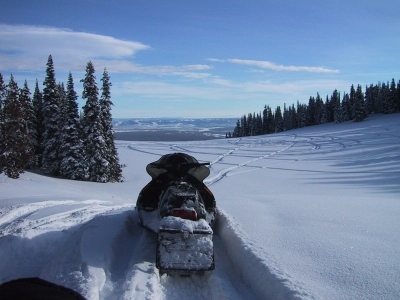 Unguided Snowmobile Trail Riding - The Gallatin & Targhee National forests surrounding West Yellowstone offer hundreds of miles of groomed and other well marked trails for experiencing the wide open spaces and the breathtaking beauty of the lands. The views are spectacular, and at the continental divide you can gaze down into the three states of Montana, Wyoming and Idaho. Guided Snowmobile Yellowstone National Park Tour - Get up close and personal with America's First National Park, as your professional guide takes you through the glistening winter wonderland, and lends a bit of information on history, wildlife, geothermal formations and local lore. View bison, elk, and other winter residents. Spend some time with your guide inside Yellowstone National Park to visit Old Faithful and other wondrous thermal features, stopping here and there to see amazing sights and wildlife. Or combine both Yellowstone National Park and the National Forests - You can have it all with this choice! Spend some time with your guide inside Yellowstone National Park to visit Old Faithful and other wondrous thermal features, stopping here and there to see the amazing sights and wildlife. Also, take advantage of Gallatin and Targhee National forests outside YNP, offering hundreds of miles of groomed and other well marked trails for those who'd like to experience the wide open spaces and breathtaking beauty of the lands, and spectacular views. Guided Snowcoach National Park Tour - If you'd prefer to leave the driving up to someone else, you can go into Yellowstone Park with a small group aboard a ten passenger snowcoach, where you are toasty warm and have a personal introduction to this First of all National Parks and all the famous landmarks with the narrative of an expert guide. Contact us for a list of preferred partners. The earliest snows in the U.S., and over 50km of groomed trails make West Yellowstone a Nordic skier's paradise. Ski and biathlon teams arrive in early November for a season that lasts through April's spring crust cruising. Ski from the Stage Coach Inn to 3 groomed trails. The Rendezvous Trail System is a 35km groomed trail with an additional 5K biathlon course/range. Bring your dog and ski the Boundary Trail, and easy groomed trail that parallels the western border of Yellowstone National Park through the Gallatin National Forest. Or choose the Riverside Ski Trail and ski right into Yellowstone National Park, along the Madison River where you could catch a glimpse of bald eagles soaring, frosty bison grazing or a beautiful pair of trumpeter swans passing by. The Riverside Ski Trail crosses very easy terrain. New skiers can try out the sport and ski to impressive views inside Yellowstone National Park. Locals send families and photographers on this trail, which glides along the Montana portion of the Madison River just inside Yellowstone's boundary. Views include the 10,336-foot Mt. Holmes and the Gallatin Mountain Range.. Bison, elk, and moose frequent the river area and sometimes use the packed trail. If you want an adventure back country skiing Yellowstone has something for you as well. Just outside of West Yellowstone, Montana, lies some of the best back country skiing in the West. Trailheads provide easy access by automobile where you can find incredible scenery, petrified trees, and winter wildlife. Located just minutes north of the Stage Coach Inn on Montana State Route 191 is Hebgen Lake - with over 21 square miles of surface and a 3 month ice fishing season that begins in January. This is an easy trip for beginners, with no hiking required, unless you'd like to explore further out on the lake and enjoy the 360 degree mountain views. During the winter, the ice is over one foot thick, and the lake is full of trout, including brown and rainbow trout. The average size is 14 -18 inches, but something over 20 inches is not uncommon. It is home to the annual NAIFC (North American Ice Fishing Circuit) tournament every January - with a Grand Prize of $14,000.00 - and a free Kid's Ice Fishing Camp where they can meet Pros and members of the USA Ice Fishing Team. Imagine gliding through snow-covered forests, smelling the pungent pines and crisp clean mountain air, warmly snuggled in blankets, with only the sound of paws hitting the soft snow! Dog sledding is the most unusual way to experience winter in Yellowstone Country. You don't have to go to Alaska to experience the thrill of the Iditarod. Visit a kennel and meet a real team of racing Alaskan Huskies from Iditarod bloodlines and then take a tour. Dog sled tours are available daily with sleds that can handle up to a family of four. It's one experience no child (or adult) will ever forget.